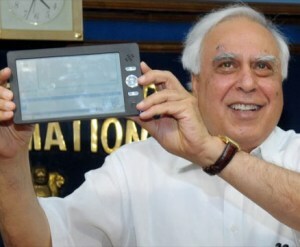 While neither the cost nor the design origin of the Sakshat super-basic tablet talked up by Indian officials is exactly as advertised, the device may in fact be getting a release this month at the price advertised, despite delays earlier this year. The low-cost tablet, rather an international collaboration made possible by globalized creation tools than an country-specific device (the same could be said for the iPhone, of course), will have 100,000 units shipped throughout India this summer if all goes well. The official price would actually 2200 rupees, or around $50. The Indian government, however, is planning on offering a 50% subsidy on purchases, bringing the price below the original $35 estimate. 10,000 would be sent out to Rajasthan this month and 90,000 more to other areas over the summer. The aim of the project is presumably similar to that of the OLPC, though with an added aspect of positive nationalism to it. Like China, which is working on its own processors to rival Intel and ARM, India would like to reduce its reliance on foreign IP. Nothing wrong with that, I suppose, though much of this ostensibly Indian project is demonstrably foreign in origin. Small steps, though.